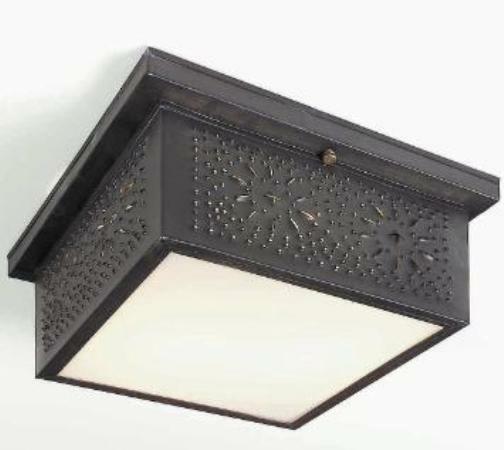 Hammerworks handcrafted Colonial Ceiling Lights combine quality craftsmanship with practical function. Most importantly, we make country style period reproduction tin ceiling lights with pride in America. Furthermore, they are ideal for any area, especially in an antique New England Farmhouse with low ceilings. As a result, Colonial home ceiling lights are a versatile option for any room. So, any place where you need overhead lighting is ideal, from kitchens and bathrooms to hallways and family rooms. Especially relevant, Antique Tin Ceiling Lights are available in a variety of sizes, styles and finish options. We create all rustic Pierced Tin Ceiling Lights with your choice of solid copper, brass or tin, as well as our custom verdigris and painted black finishes. Also, because we make Flush Mount Tin Ceiling Lights by hand, we always welcome custom options. Thus, for example you can choose to change or eliminate any of the “bars” or “grids” for a different appearance. In addition, each of these finish options, (except antique tin) is rated for both exterior and interior locations. 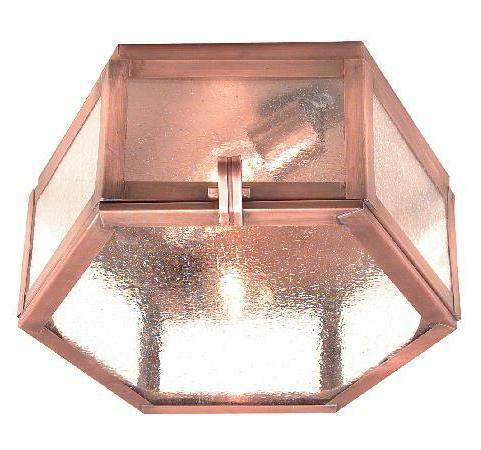 Therefore you can install our Copper Ceiling Lights in an outdoor covered entryway of your home. As a result, they will coordinate with your exterior copper & brass wall or post lights. Furthermore, we equip each antique reproduction ceiling light with 2 medium base sockets, rated for 60 watts. This provides plenty of illumination for your space. 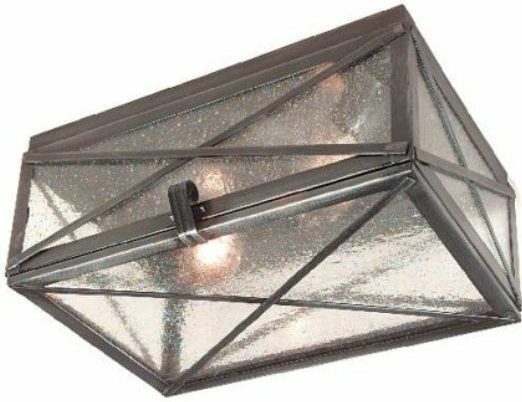 Consequently, whether you are looking for interior or exterior flush mounted ceiling lights, Hammerworks has the right one for you! 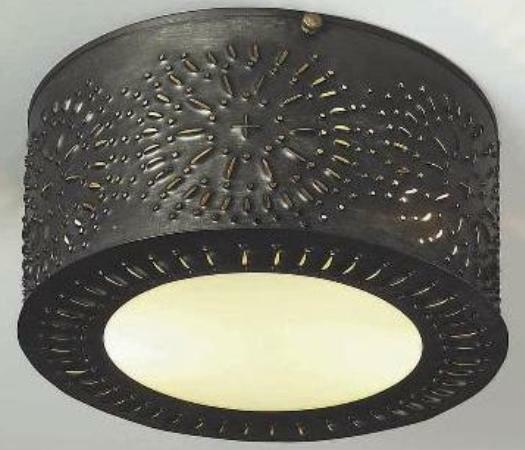 A unique and popular choice, our Pierced Tin Colonial Ceiling Lights offer a one of a kind ambiance to any space. Most importantly, the reflection of the punched design adds a rustic charm to any room. Just as with our Colonial Tin Chandeliers, we make our pierced tin lighting completely by hand with attention to detail. Consequently, we hand punch each fixture one at a time. In addition to antique tin, these primitive reproduction punched design ceiling fixtures are available in a variety of style and Finish Options. These include antique copper and brass, as well as our custom verdigris or painted black. 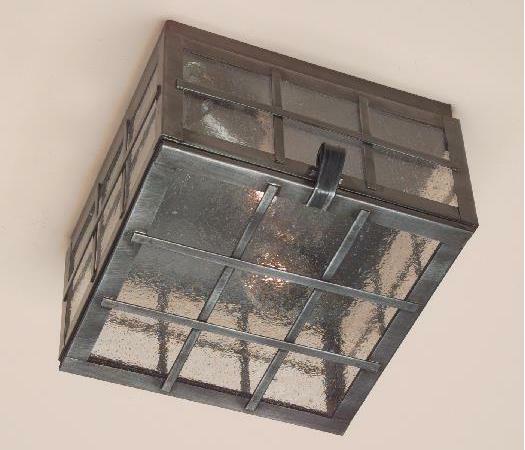 Furthermore, we make punched tin ceiling lights in both square and round styles. Consequently, no matter the design and color scheme of the room, you’ll find a suitable choice in our collection. In addition to flush mount styles, we handcraft several Colonial Pierced Tin Chandeliers and Pendants. Certainly, these rustic chandeliers are a great choice for a country kitchen or dining area. Sometimes called a Colonial Punched Tin Witch’s Hat, we offer these chandeliers with or without the punched design. Furthermore, pierced chandeliers like the CH101 are available in antique tin or brass finish, with a variety of arm configurations. Each chandelier, like the Colonial Pendant Tin Chandelier CH102 comes with a down light in the center cone, rated for a 60 watt medium base bulb. In addition, you can put up to a 60 watt small candelabra base bulb on each arm. Another charming option, our handmade Antique Tin Punched Light Shades SH101, is a great choice for your reproduction period home. Most noteworthy, the reflection of the piercing on the ceiling is delightful!. Also, as always these pierced pendant lights come in your choice of antique tin, copper or brass finish. Finally, depending upon size, the center cone accommodates a medium base 75 or 100 watt bulb. Our handcrafted New England Style Onion Lights are another great option for you. First and foremost, expect the same attention to detail and historical accuracy as you find throughout our handmade lighting. In addition, we make each hanging onion ceiling lantern out of solid copper or brass. Furthermore, we offer a custom verdigris finish option upon request. Also, Colonial Ceiling Onion Lanterns are available in both flush mounted, or as Copper Hanging Onion Lights. Because each of our New England style onion ceiling lights coordinates with corresponding Onion Post Lights & Colonial Onion Wall Lights, it’s easy to create a uniform look. As a result, you will find an onion light that is perfect for your home. Of course, in addition to a complete line of handcrafted onion lanterns, our styles include many types of Early American period reproduction light fixtures. This includes outdoor Colonial Post Lanterns, wall, & hanging lights. Additionally, for inside the home we create Colonial Wall Sconces, tin & brass chandeliers and Colonial Wood Chandeliers. 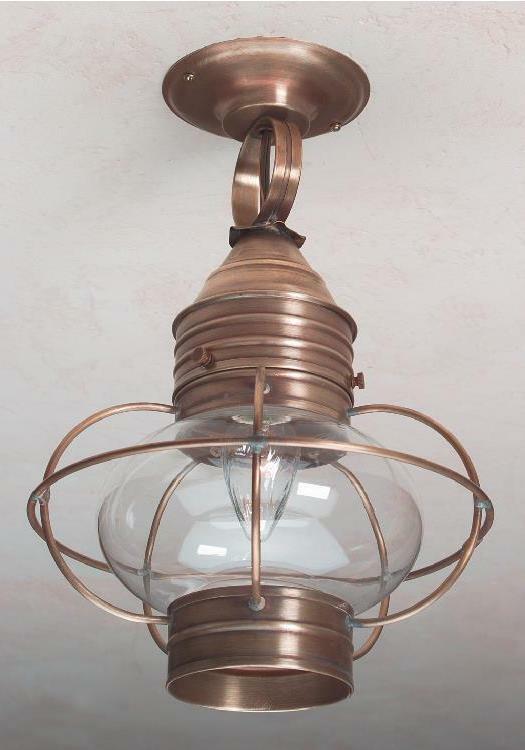 Our period reproduction lighting also includes a collection of Craftsman Style Fixtures. Of course, our Arts & Crafts Lighting is also handcrafted. We include coordinated hanging, wall and post mount fixtures. Whether you own a reproduction Early American Colonial, New England Farmhouse, Cape Cod, or Craftsman Style home, we have a lighting collection for you. Most notably, for any area with height clearance, handcrafted Colonial Home Hanging Outdoor Copper Lanterns are an ideal choice. As always, we make each hanging lantern out of solid copper or brass. Furthermore, custom finish options of painted black and verdigris are available upon request. Also, hanging pendant lanterns range in style from primitive to traditional. Because each of our hanging lanterns coordinates with corresponding post & wall lights, it is easy to create a uniform look. As a result, there is a design perfect for your home. No matter what, at Hammerworks we deliver quality & craftsmanship one light at a time.